Jean-Michel Moreau le Jeune (1741-1814) Telemon and Aeacus (date not known), further details not known. Wikimedia Commons. Progressing through the second half of Book 7 of Ovid’s Metamorphoses, Medea has been despatched into oblivion following her attempt to poison Theseus, whose career was summarised at breakneck pace. This leads Ovid into a linked series of little-known tales centred on the island kingdom of Aegina. King Aegeus of Athens was delighted that his son Theseus had returned, but his pleasure was short-lived when King Minos of Crete threatened war against Athens. Minos assembled a fleet of ships, and cruised the islands obtaining the allegiance and support of the small kingdoms there. When his fleet came to the island of Aegina, its king, Aeacus, refused on the grounds of his binding treaties with Athens. As the Cretan fleet sailed, Cephalus arrived from Athens, and was told of Aeacus’ unfailing allegiance. However, he noticed that people and things had changed since his last visit to Aegina. King Aeacus then takes over the narration, giving his account of the plague which almost destroyed the people there. It had arisen because of one of Jupiter’s extramarital affairs, with the nymph of the island, inevitably named Aegina; Juno’s jealous reprisal against the nymph was largely expressed in a plague which she sent against the people of the island. Aeacus gives a vivid account of the deadly consequences of an infectious disease which sounds much like the occasional epidemics of the plague which have struck the population of Europe. In the end, with corpses being piled high unburied or in funeral pyres, Aeacus called on Jupiter either to give him his people back, or to kill him. in that weird vision of the moving ants. “They all advanced, and hailed me as their king. Aeacus called these hard-working people Myrmidons, a name derived from the Greek for ant, μύρμηξ (myrmex). Later legend tells that the Myrmidons moved to Thessaly, whence Aeacus’ grandson Achilles took them into the Trojan War. The word has even entered the English language, although little-used for over a century. It came to mean a loyal and unquestioning follower, much like a worker ant. One of my major references to artistic productions concerning classical myths, The Oxford Guide to Classical Mythology in the Arts 1300-1990s, which stretches to over 1300 pages in two volumes, doesn’t even have an entry for Myrmidons, and extensive searching has failed to reveal a single painting depicting Ovid’s story. I find this very strange, as it is rich in visual imagery and opportunities. Virgil Solis (1514–1562), Myrmidons (1581), engraving for Ovid’s Metamorphoses Book VII, 622-642, fol. 94 v., imago 11, location not known. Wikimedia Commons. The first work of visual art which shows the Myrmidons seems to be Virgil Solis’s engraving for a 1581 edition of Metamorphoses. 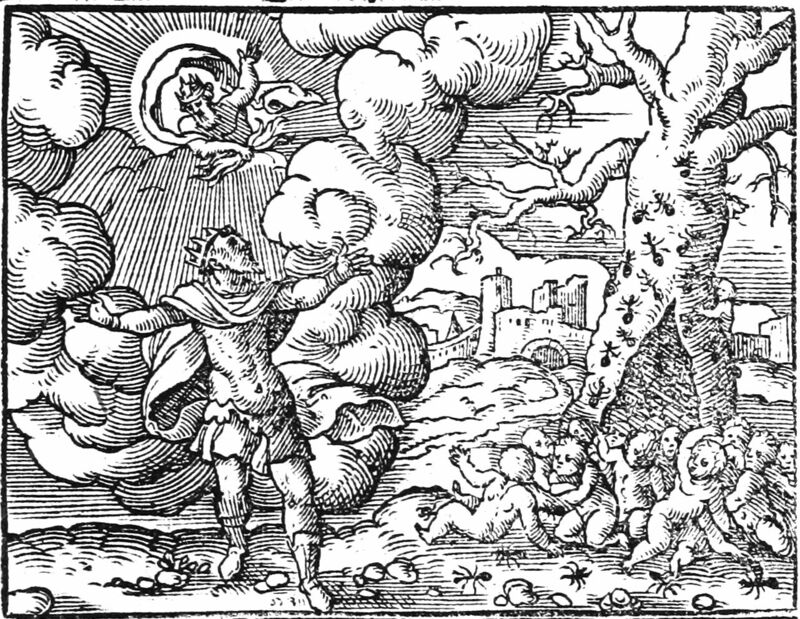 King Aeacus is shown calling on Jupiter to repopulate the island, as the ants climb the old oak tree, and babies spill out from a cleft in its trunk. 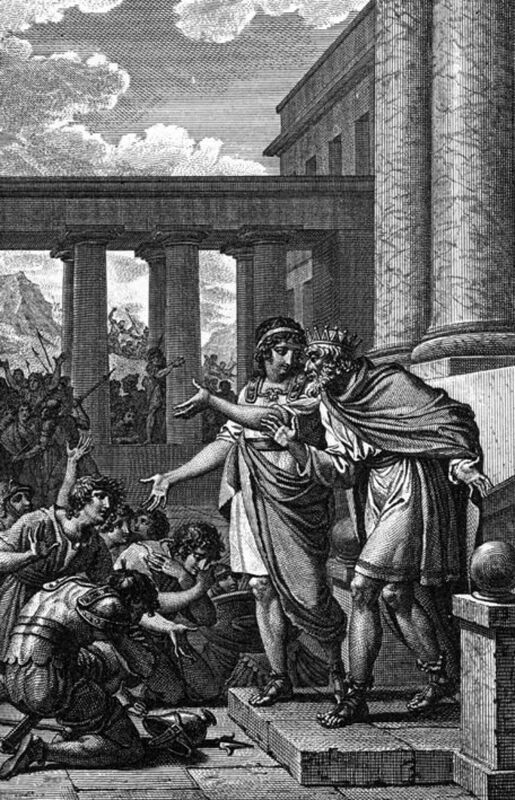 That was followed in the latter half of the eighteenth century by this engraving by Jean-Michel Moreau le Jeune, Telemon and Aeacus, which shows Telemon taking his father Aeacus out to see the loyal and hard-working Myrmidons at the end of the story. I suspect that this too was made for an illustrated edition of Metamorphoses. If Aeacus did not make sufficient impression on artists, the figure of Minos did, particularly as he – together with Aeacus, and Rhadamanthus – was made a judge of the dead in Hades, after his death. Michelangelo di Lodovico Buonarroti Simoni (1475-1564), The Last Judgment (1537-41), fresco, Cappella Sistina, The Vatican. Wikimedia Commons. Michelangelo shows Minos in that (Christianised) role in his huge fresco The Last Judgment (1537-41), with his attribute of a snake, which appears to be about to do Minos something of a mischief. Minos also features in Dante’s Divine Comedy, which brought him to the attention of two of the greatest illustrators (and fine artists) of the nineteenth century, William Blake and Gustave Doré. 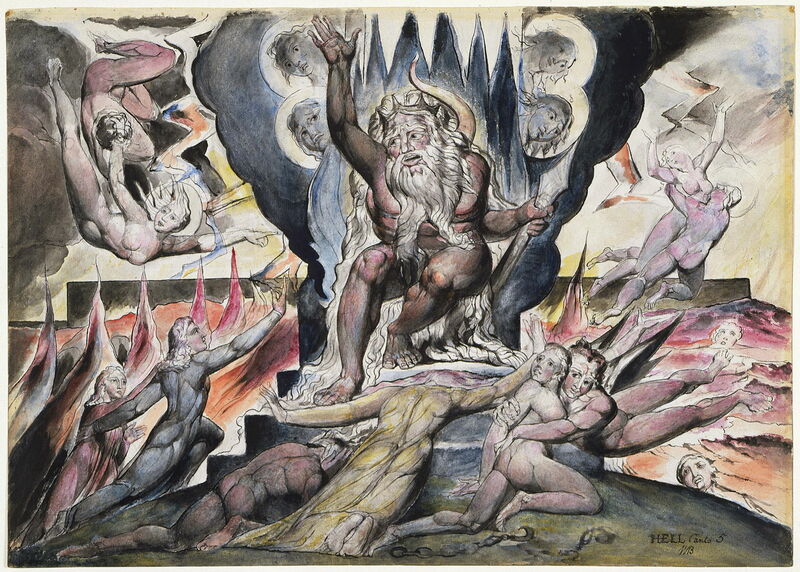 William Blake (1757–1827), Minos (1824-27), illustration to Dante’s “Divine Comedy”, watercolour on paper, dimensions not known, National Gallery of Victoria, Melbourne, Australia. Wikimedia Commons. Blake’s watercolour of Minos (1824-27) shows him presiding in judgement over four cavorting couples, in a profoundly radical vision. Gustave Doré (1832-1883), Minos, Judge of the Inferno (c 1861), illustration to Dante’s “Divine Comedy”, engraved by Gaston Monvoisin, further details not known. Image by Moïra Elliott, via Wikimedia Commons. 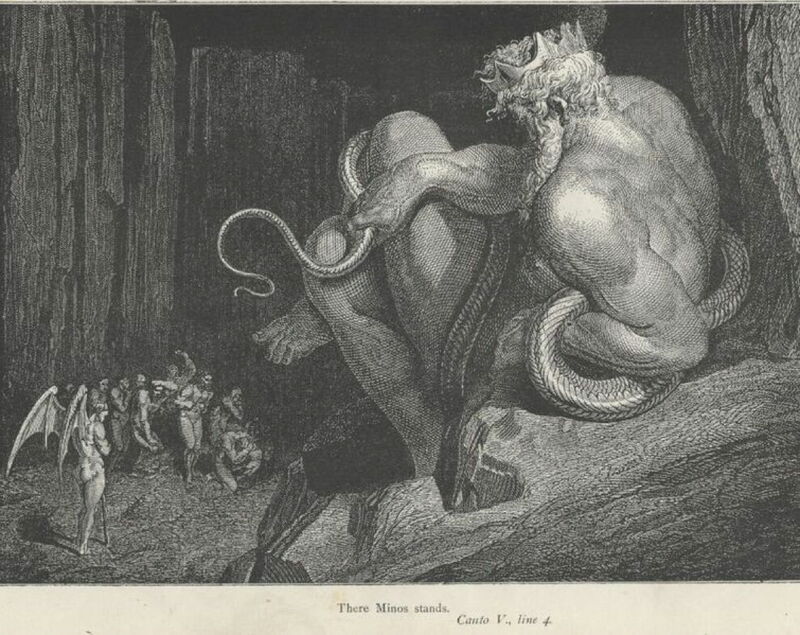 Doré’s version, engraved here by Gaston Monvoisin, is more restrained, and shows Minos’ trademark serpent. Below him are souls queued up for his judgement. I am puzzled as to how this very visual story has escaped the attention of painters for so long, particularly as Ovid’s next myth, of Cephalus and Procris, has been so popular as to become quite hackneyed. Posted in General, Language, Life, Painting and tagged Blake, Doré, Metamorphoses, Michelangelo, Moreau, Myrmidon, myth, narrative, Ovid, painting. Bookmark the permalink.